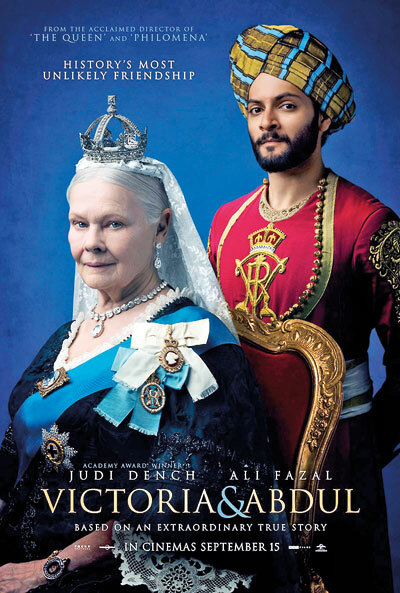 “Victoria & Abdul”, a biopic comedy drama narrating how Queen Victoria strikes up an unlikely friendship with a young Indian clerk, Abdul Karim, is now being screened at Liberty cinema Colombo. Based on the book of same name by Shrabani Basu, and on the real-life relationship between Queen Victoria and her Indian servant Abdul Karim, the film is directed by Stephen Frears and written by Lee Hall. Abdul Karim arrives from India to participate in Queen Victoria’s golden jubilee. The young clerk is surprised to find favour with the queen herself. As Victoria questions the constrictions of her long-held position, the two forge an unlikely and devoted alliance that her household and inner circle try to destroy. As their friendship deepens, the queen begins to see a changing world through new eyes, joyfully reclaiming her humanity. The film stars Judi Dench, Ali Fazal, Eddie Izzard, Tim Pigott-Smith, Adeel Akhtar, Simon Callow, Michael Gambon and Julian Wadham in the lead roles.